This item has been discontinued. See Related Items below for alternatives. The most advanced CPR coaching device is available now from ZOLL Medical Corporation and AED Superstore. It's the PocketCPR! The PocketCPR combines a typical pocket-sized CPR voice prompting system with a unique CPR feedback function. This device prompts the user through all steps of CPR and measures chest compression depth to advise the user to "Push Harder" if needed. If chest compressions are performed correctly, the device reassures the rescuer by saying "Good Compressions." Does all this sound familiar? It should! These same features are found on ZOLL's AED Plus and AED Pro defibrillator models, too. 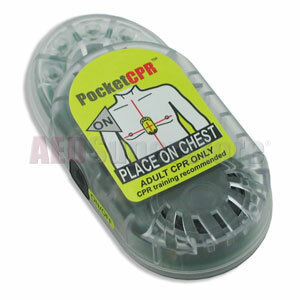 The operation of the PocketCPR device is straightforward. Power it up and place it on the patient's chest using the normal "landmarks." A short power-up system test is followed by clear AHA 2010 Guidelines CPR instructions. In addition, flashing lights and a metronome further direct the rescuer. The rescuer places both hands in the normal chest compression position right on top of the PocketCPR unit. It then provides feedback to the user to reinforce or correct performance during the emergency. The PocketCPR uses an included replaceable Duracell 123 battery which is the same size battery used in the ZOLL AED Plus. Your Price: Call now for best price!